It's a good day for Australian metal fans. Soundwave have announced the addition of another three acts to the already huge lineup for the 2016 festival. Joining the likes of Disturbed, the Prodigy and Bring Me the Horizon are Killswitch Engage, Ill Niño and Terror Universal. 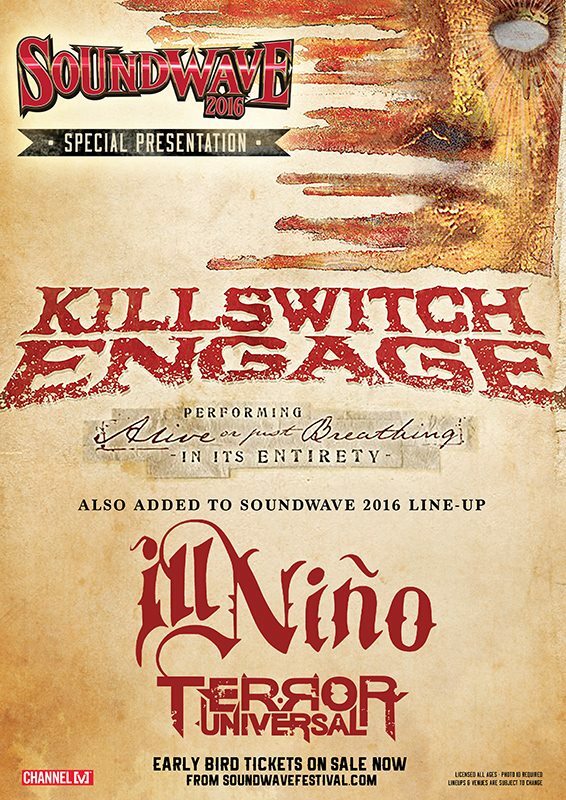 But this is more than just adding some new acts... Killswitch Engage and Ill Niño will be performing one each of their classic albums in full! Killswitch Engage’s Alive Or Just Breathing album was a watershed moment in metal in 2002 as it heralded the birth of metalcore. An army of imitators was born and have all tried in vain to emulate this essential classic. In a Special Soundwave Presentation, the festival is thrilled to announce that Killswitch Engage will be performing Alive Or Just Breathing in its entirety at Soundwave 2016. Joining Killswitch Engage and Ill Niño are horror metal cannibals Terror Universal. Featuring current and former members of Machine Head, Soulfly, and Ill Nino, Terror Universal announce their return to Soundwave 2016 and will continue their reign of terror, in the pits of Soundwave Hell. Discount early-bird tickets are still available from Soundwave. Be quick, they're not on sale for long! Adelaide photos from Day One and Day Two. Sydney photos from Day One and Day Two. Sydney review of Day One and Day Two.